New York indie post punkers with a huge future ahead of them. Who are they? New York indie post punkers with a huge future ahead of them. 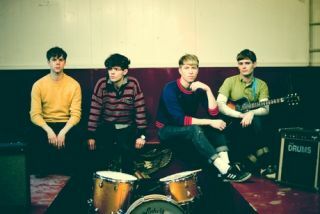 Sound like: Feel good 21st century US indie which harks back to The Smiths and The Cure. Why should you check them out? Firstly, because they have an utterly awesome name. But, if that isn't enough to sway you, thankfully they're also armed with some uber cool indie tunes which cover more ground in three minutes than even the liveliest of Premier League footballers. There's touches of The Smiths and The Cure, but also flashes of the Beach Boys and even the odd glimpse of John Lydon's Public Image Ltd.
All of which must keep things interesting for drummer Connor Hanwick. Connor proves during the band's debut album that he's up to the challenge of reigning in those around him to ensure that The Drums produce cohesive indie pop, rather than the mish mash of genres that they could so easily churn out if they're not careful. With appearances at Glastonbury and Hyde Park coming later this month, don't be surprised if The Drums are the next US export to go global.